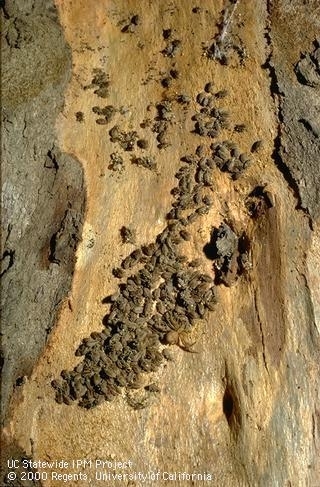 As the weather turns cool, how will insects cope with this? Have you ever pondered what keeps insects from perishing in unfavorable environmental conditions; they obviously survive successfully and annually compete with us for crops. This may have not “been on your mind” as much as the last 49ers football game or the stock market ups and downs but nevertheless it is important. With the millions of species of insects in the U.S., there are also numerous strategies for dealing with poor weather. Depending on the species and geographic location, some species must deal with cold weather, some with hot conditions, some with extremely dry conditions, etc. In terms of cold and hot weather, the key difference between mammals and insects is that mammals can regulate their body temperature (for instance, for humans 98.6oF is the standard regardless of the environmental conditions). This allows metabolism and other body functions to continue regardless of the environmental conditions. This regulation occurs in humans (except for the drastic extremes where the potentially fatal conditions of hypothermia or hyperthermia set-in). Insects and related organisms cannot actively control their body temperature and it closely mirrors the environmental temperature. Therefore under warmer temperatures the body functions (growth, development, feeding) occur more quickly and the inverse happens with cool temperatures. In extreme conditions, the insects perish. To deal with cold conditions, insects can burrow into the soil or under crop residue for protection or they may have evolved a life cycle such that a less susceptible life stage (one that is not actively feeding such as an egg or pupae/cocoon) exists during the cold period. Some species actually contain ethylene glycol (anti-freeze) to help with the cool conditions. Other species enter a diapause state which is a condition of reduced activity analogous to hibernation in mammals, such as bears. Diapause is genetically programmed into the insect species (they cannot “decide” to enter diapause at the “spur of the moment”) and it does not occur in direct, immediate response to cool weather. For hot, summer weather, some insect species burrow into plant material for shade and cover from the conditions. This activity can be an immediate response to hot weather or it can also be genetically determined in a condition known as aestivation (the counterpart of diapause). For alfalfa pest management, adults of the alfalfa weevil and Egyptian alfalfa weevil enter an aestivation period during the summer months in California. 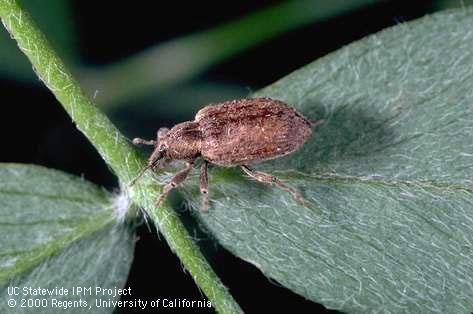 From about May to November/December most, if not all, of the weevil adults leave the alfalfa fields for protected areas such as ditch/irrigation banks, lawns, weedy areas, etc. One of the classic areas the weevil adults accumulate during the summer is under the loose bark of eucalyptus trees or other trees with loose bark. Egyptian alfalfa weevils aestivate outside alfalfa fields during the summer often under bark of trees. In the late fall and early winter, the adults move back into the alfalfa fields. They do not readily fly so most of this movement is via crawling. 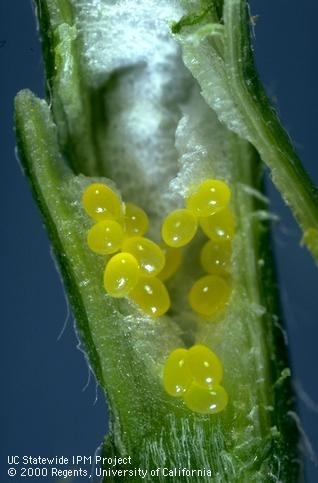 Once in the alfalfa field for a few weeks, the females lay eggs by inserting them into alfalfa stems and these eggs hatch to become the damaging larval population the following late winter/spring. Knowledge of this weevil biology, spurred a project in the 1980’s to try to predict the dates when the weevil adults moved back into the alfalfa fields (it varies somewhat from year-to-year based on fall temperatures). The plan was that once the adults were back in the alfalfa fields but before they deposited eggs in the alfalfa stems, an insecticide would be applied to kill the weevil adults. This concept, if successful, was thought to have several advantages over the standard IPM technique of treating for weevil larvae when threshold levels are reached in the late winter/early spring. Some of these advantages were 1) not affecting in-season populations of beneficials since the insecticide is applied in the late fall/early winter, 2) a reduction in sampling of larval populations in the late winter/early spring, and 3) damage in the late winter/early spring would be mitigated. This fall treatment program relied on the use of carbofuran insecticide which was very effective on weevil adults and was systemically picked-up by alfalfa plants to produce a long residual period of control. This insecticide is no longer registered and available in the U.S. for agricultural crops although other insecticides may have a fit for this use. The program conducted in the 1980’s showed potential but produced inconsistent results. The common phrase “more work was needed” applied. The success seemed to depend on when the weevil adults ended their period of aestivation and re-entered the alfalfa fields and this needed to be more closely defined. But the program did show potential for managing the weevils when they were again ready to face the “real world” in the alfalfa field. Read more about Egyptian alfalfa weevil management here.